Mark Gath’s farmhouse in Luverne, Minnesota, sits 30 miles down country roads from Sioux Falls, South ­Dakota. From that base in the heartland, Gath, a sturdy man in boots and a blue shirt, farms more than 10,000 acres of corn and soybeans with the help of his wife, Leah, and sons. Though his farm is larger than average, he feels squeezed by low commodity prices and the rising costs of seeds, pesticides and equipment. “Everyone is scared out here,” he says. So when Gath’s sons told him two years ago that for a nominal fee he could get information on corn and soy seed prices from a startup called ­Farmers Business Network (FBN), he signed up. Seed prices are ­surprisingly complex, but even herbicide and pesticide prices vary depending on a farm’s size and location, and agricultural suppliers tend to bundle products in a way that obscures their true cost. Since its founding, FBN has built a network of more than 6,500 farms to which it offers information, an online store and marketing help—all with the goal of making farmers more profitable. Backed by nearly $200 million in venture capital—from the likes of T Rowe Price, Temasek, Kleiner Perkins and GV (Google’s VC arm), among others—FBN is trying to do nothing less than save America’s family farms while also building what its brash CEO, Amol Deshpande, hopes will become “the biggest agricultural business in the world”. 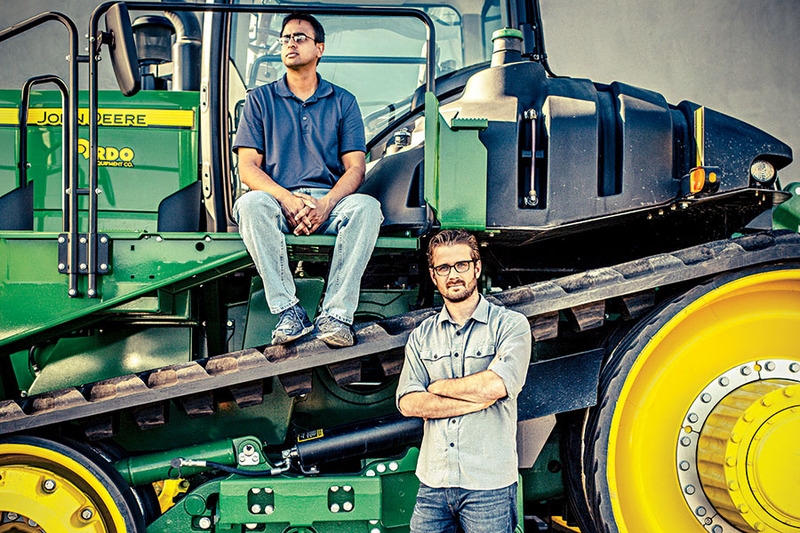 The startup’s founders, Deshpande, 40, and Charles Baron, 34, want to shift lev­erage from giant manufacturers like DowDuPont and Monsanto. Collectively, farmers produce nearly $200 billion worth of crops a year, but individually they have little bargaining power. By bringing them together, FBN’s sprawling operation helps farmers get better prices on both the goods they buy and the crops they sell. The startup expects revenue of $200 million this year, up from $72 million in 2017, and Deshpande and Baron are already talking about an IPO. Back in 2006, Baron, a California native, spent the harvest working on his brother-in-law’s farm in Arapahoe, Nebraska. After joining Google as a program manager and then getting an MBA from Harvard, he kept visiting the farm and was dumbfounded by how much information remained inaccessible. For example, a farmer couldn’t even compare his yields with those of previous years or neighbouring farms. Then, in 2011, Baron met Deshpande, a Kleiner Perkins partner focusing on agriculture. After getting a degree in chemical engineering, Deshpande, who’s the son of Indian immigrants and has an MBA from Cornell, worked at agricultural giant Cargill. But he hated the bureaucracy and moved to Silicon Valley. Two years later, Baron and Deshpande started talking and decided to travel across the farm belt to ask farmers what was causing them pain. Their epiphany was that while farmers needed data—the choice of what seed to plant, in what density, using which fertilisers, herbicides and pesticides, can be exceedingly complex—the data wouldn’t be enough. FBN launched in 2014. Farmers who joined the network—the cost is now $600 a year—and shared their data could use analytics to help them figure out what combination of seeds, chemicals and fertilisers were likely to offer the best yields. By June 2015, 620 farms had signed up. Today FBN serves more than 6,500 farms in the US and Canada, representing more than 24 million acres. That’s a small dent; in the US alone, 2.1 million farms cover 915 million acres. In late 2015, FBN launched FBN Direct, a bare-bones store that is now fully online. Buying seeds, herbicides, pesticides and other inputs isn’t like shopping in other retail businesses. The retail co-ops that dot rural America typically bundle seeds and chemicals and vary prices depending on the farmer’s acreage, credit rating and location. At FBN’s ­online store, by contrast, farmers can see the actual price for whatever they need. FBN Direct launched with 170 products and now offers around 1,000, many of them generics. Still, agri-giants DowDuPont, Monsanto and Syngenta have refused to sell their products through FBN. Even some manufacturers of generics are waiting. “In an ideal world, if I could flip the switch and sell to these guys, I would do it in a heartbeat,” says the CEO of a generic-chemicals maker. “We like what they are doing, but they just don’t have critical mass at this point.” The result is that FBN has had to rely on brokers, who may be unloading excess inventory, to get name-brand products to sell. In other cases, FBN offers cheaper generic alternatives. It sells products without the services many farmers expect, like free resprays should a pesticide fail to work. “There are no frills,” says Pat Duncanson, a fifth-generation farmer in Mapleton, Minnesota, who says the low prices are generally worth it. The test, however, hasn’t proved to be a big win. It launched late in the buying season, and Stine’s national pricing on FBN wasn’t much different from its local prices offline. While the two sides hope to continue their relationship in the fall, when farmers begin buying seeds for the 2019 growing season, Stine says he wonders whether seeds may be too complex a product to be sold through a website. That would be a blow to FBN, but Baron says he’s still “very bullish” about FBN’s ability to sell seeds. Meanwhile, Deshpande and he keep looking for ways to give farmers leverage. While prices have been depressed for commodity crops, farmers who have switched to non-GMO corn or soy or to ­lentils or chickpeas have been able to improve margins. But because there’s a lag of six months or more between planting and harvest, many farmers have been reluctant to make the transition. Last year FBN launched a crop marketing programme that guarantees farmers will have a buyer. For example, it cut a deal with Calyxt, a biotech firm that has developed a high-oleic soybean through gene-editing technology. FBN’s farmers can make $50 an acre or more over regular soy by using Calyxt’s seeds. FBN also offers contracts for non-GMO corn and soy to farmers who switch. Indian Ecommerce Policy: Can it help small and medium businesses?